Journalist Tracey Spicer has accused The Guardian of “exploitation” of freelance workers after she was asked to write a 1,000-word branded content column on women’s financial empowerment for client ANZ for $140 – 14 cents per word. Speaking to Mumbrella Spicer said: “This is a major media outlet that’s done a deal with one of the big four banks and the way it is making money for two very powerful players is by exploiting freelance writers. Branded content and native advertising – ads that appear in the main editorial stream of a media website – are becoming an increasingly important revenue stream for publishers like The Guardian, which has a division called Guardian Labs dedicated to the process. The Fairfax and Debrief Daily columnist spoke out against the offer in a post on her public Facebook page this morning. “Does anybody else see the irony here? Who else is being asked to work for next to nothing in this brave new world of branded media? Exploitation – especially of women and young people – seems rife,” she wrote. Spicer, who has more than 26,000 followers on Twitter, stressed this was not about her own pay but rather about making it fairer for all contributors. “This is not about me, I’ve got enough work, Fairfax pays me well, Debrief Daily pays me well, Sky pays me well. I’m ok. I want to speak out for other people who don’t have the profile or power that I have,” she added. Guardian Australia managing director Ian McClelland declined to comment on its rates publicly, however said in this case the “wrong rates were applied”. “The Guardian doesn’t discuss its rates publicly – that’s a matter between us and our journalists, but we are comfortable our rates are industry standard,” he said in a statement. “However, in this instance the wrong rates were applied to this particular project. According to the Media, Entertainment & Arts Alliance, the national freelance award rate is $925 for 1000 words or less, with 93 cents a word for each word after. However Spicer did note “very few outlets pay the award rate”. Mumbrella understands magazines can pay between 30c and 80c a word while newspapers generally pay between 60c and $1 a word, still well above the 14c per word offered in this case. It is likely to stoke the debate around who should be tasked with producing branded content, with some arguing it should be kept away from in-house journalists or risk jeopardising the divide between sales and editorial, often referred to as ‘church and state’. ANZ Australia group general manager of corporate communications Paul Edwards tweeted an apology from the bank, which reported first quarter profits of $1.65bn, shortly after Spicer’s initial post, saying “that’s not how @ANZ_AU wants to be working”. 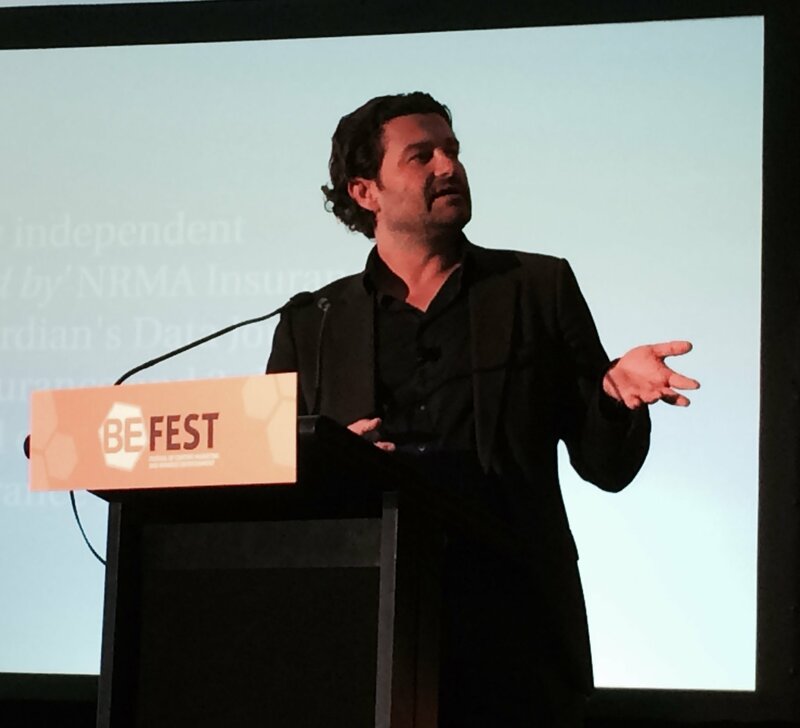 He told Mumbrella he expected more from The Guardian, but conceded the bank must learn from the experience. “It’s somewhat ironic that this rate was offered by a media organisation who ought to know better,” he said. “We’ve got a bit to learn about branded content, most corporates do. We clearly have parts of the bank who are new to working on branded content and with journalists. 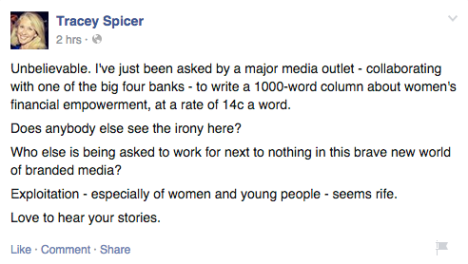 It’s a topic Spicer is passionate about, and has previously written about exploitation of women in the workplace for Fairfax Media’s Daily Life, saying women already work an average of 62 days a year for free. “Many media outlets use the excuse of exposure and a lot of people who do need the exposure or need the money are more tempted to take the offer. The problem is it demeans the role, the task, and the job of being a writer,” she said. “Now I’m thinking we should start a campaign of naming and shaming these media outlets, they’re the ones who chose to pay so little. The post has sparked a number of people tweeting or commenting about their experiences of being exploited in the workplace. ANZ launched its own content site Bluenotes in April last year. Paul Edwards said the site offers $1.20 per word to freelance contributors. The MEAA has been approached for comment. Last year Mumbrella held a debate with practitioners on the issues arising from branded content. Issues surrounding native ads and branded content will be discussed at next week’s Mumbrella 360 Conference. Click the banner below for more details. This is NOT an exception to the industry, but has become practice, especially in the tech industry. Whereas it used to be 30c as average (some paid 50c), major internationals are now offering around 10c. Of course they stress their hands are tied due to “budgets”. Closer to 5c/word in the music and arts press. Sadly I know many copywriters (new and established) who would bite your hand off to get that rate. The going rate for articles/ blogs seems to be dropping like a fat badger down a greasy tube. It’s depressing, but there is no industry standard on award rates for freelance writers – at least not one that’s adhered to. Publications seem to set their own house rules and the policing of any standardised pay rate is nonexistent (based on my experience). That sad industry norm aside, Tracey Spicer’s a high profile personality doing work on a big bank’s dime. It’s almost impressively sneaky to toss off subtle celeb endorsement for a cheap per-word rate card. There are plenty of publishers paying terrible rates – particularly in my area travel writing – and many think you should do it for free “to raise your profile”. Never mind if you’ve been writing for 30 years. Others pay something for words then want you to give them photos for free. It’s possible The Guardian is one of those – if indeed it pays at all. I don’t know. The Huffington Post doesn’t. The Newcastle Herald doesn’t. I could go on. There’s one answer: no matter how desperate you are, don’t work for peanuts. As a travel writer I know of quite a few folks who give their stories away. One school of opinion says it is partly because bloggers without training do it for next to nix or “exposure”. 93 cents a word? Where do you sign up for such a rate in 2015? what’s the name of the magical site that could afford to pay it? Good on Tracey for calling them out.that rate is outrageously low. However I’m a professional freelance writer and have NEVER been paid 90c a word! I’ve done branded content for some major banks recently and was paid around 35c a word, which I felt was fair. lol ” national freelance award rate” – when MEAA comes back with a “comment” can you ask why this is never, ever enforced? I’ve been paid “award” once. It doesn’t exist and MEAA needs to stop pretending they care about freelancers. Unbelievable, really. Is that counted as slave labour? While I can see Tracey’s point of view, the fact is 95c per word is incredibly high and I’d like to know where I can sign up for it! Content is so expensive to produce in Australia, far more expensive than in most other parts of the world. I’ve been a journo for 20-odd years and I also write paid-for content and I can tell you, I’m never paid what I or my experience is worth, which is a shame, but it’s the reality too. It’s a capitalist economy we’re working in and if Tracey doesn’t like it, that’s fine, but don’t take the job. That said, ANZ make a shed-load of money and can afford to pay better rates. I think it depends on who’s doing the commissioning and how much THEY’RE making off the piece! 93 cents a word? Every time I read that I fall on the floor laughing. Please Mumbrella list the names of all the publishers who do pay the award rate. I can assure you it will be a very, very, very short list. But this is a trend happening too much in our industry. Good on Tracey for shining some light on it and making ANZ respond to it. I would bet she would not have received such a retraction unless she went public with this. Price of an article written by a respected and hugely influential talent? $140. Cost of a negative tweet about your brand by the same influential and hugely respected talent? This isn’t just happening in your industry – it needs to be called out in all business -its a case of needing to address our ethics in business – you should see what is happening in the Community Services industry – making money out of vulnerable women especially – an industry where the workers are seen as commodities that keep getting “trimmed and trimmed” – there is so much burn-out and sickness in the carer industry it is really disturbing especially as unions have become so emasculated and ineffective. And everybody pays a high price for this stupidity – the clients suffer hugely, the medical system suffers – its madness. I’ve worked with dozens of writers over the last decade running blogs that gets millions of visits. Let me tell you: there’s no correlation between the rate the writer demands and the quality of the article she produces – here defined as the article’s ability to achieve the company’s desired metrics. In my experience, writers who asks to be paid 10c a word are just as talented as the ones asking for $1. So why pay more? I’m willing to bet if you do a “blind” test, most people can’t tell which article is from a $1 per word writer vs a $0.10 a word writer. If you have the data to suggest otherwise, let me know. Is it just me, or is her whole ‘it’s because I’m a woman’ thing, completely irrelevant and, unnecessary here? Sure the subject matter was about female empowerment, but I’m not sure her femininity has anything to do with that rate. Well, let’s spell it out, Guy – it’s the irony of being offered such a low rate for writing an article about female empowerment, which she was asked to do precisely because she’s a well-regarded woman writer…. What does Mumbrella pay a word? We don’t use many freelancers on a per-word based (and don’t do branded content) – but when we had Encore we paid 60c per word, and we recently paid above award to another contributor. Yes I agree “Guy Sebastian”: nothing to do with her being female, it’s acoss the board, though it’s interesting that “A Marketer” refers to “she” only. “A Marketer” you have defined the problem and you are the problem: a lot of writers and journalists who consider themselves professionals (eg I’m a former newspaper journo, subeditor and editor) are being lumped into the same category as “bloggers” and our work devalued as such. Rather than be paid on the value of our work/experience/knowledge we are offered (or more appropriately not offered, overlooked) the same rates as someone who, on a whim or with clear commercial intent, decides to start a blog one day to make a buck. I don’t write corporate content, but it’ s damn nigh impossible to make a living writing (non-corporate or promotional content) for print or online media anymore…. I have written in the past for a major airline and the body promoting Australia to the world and I would do so again if I “liked” the “product” or believed in it. And yes, if I chose to write corporate (or “branded” content as you like to call it) pushing someone’s barrow, I wouldn’t consider doing it for less than 90c a word. We writers are being evaluated, judged or “valued” by people like you in advertising or marketing who then go on to brag about how cheap they can get it…nothing’s changed since Renaissance artists worked for the merchant classes. Hey, I bet I can do a better more effective campaign than you for your sucker client for $10,000 not the $200,000 you are probably charging them…….and they won’t be able to tell the difference ….in fact they’ll probably get way better results ……..any takers? I’ve been doing the sort of work Tracy’s talking about for nearly a decade, and I can safely say that rates are only getting worse. What’s amazing in instances like these is that The Guardian or another publication in the online space would have been paid significantly more by the client, so they’re actually skimming most of the cream off for themselves. It’s an old argument, but go where the eyeballs are. I don’t give two shits if it’s not in print, the same per word rate should apply online. Australian web publishers, perhaps try to commission less crap and focus on what’s better rather than trying to compete with Buzzfeed and you might be onto something. I frequently find myself accepting $100-150 for 1000 word pieces from some of the biggest in the biz. It’s an insult. It’s also all that’s going – you might get a bit more for branded stuff but not much. If that was my fulltime career, I’d be in the dole queue tomorrow. As a matter of fact, Fairfax online are the only ones I have worked with who actually pay decently per word no matter where you are published (though I don’t do anything with News). Bravo John (13) & Karen (21). Karen: was going to say almost the same thing but you beat me to it. Funny how “a marketer” (16) doesn’t have the guts to use his own name (surmising it’s a bloke by use of language). Slight integrity deficit there perhaps? Which is why people like us (journos/writers) get paid to write this stuff In the first place, instead of people like you. Thankfully I’m not freelance anymore, but even an offer of pay from one of the big companies is astounding to me. I was told multiple times by Fairfax and others that I should be grateful for the opportunity to “get my name out there”. I suppose it would have been nice to have my name out there so the world would remember me after I’d starved to death. Wow, now using “she” to describe a person is also sexist apparently. Here’s the bottomline. A business produces content for a purpose. That purpose is to achieve a goal, which in turn improves its bottomline somehow. You want $1 a word for the article, the other writer wants $0.10 a word. We see no difference between the two writers, as far as achieving the goals go. Tell me, say, why should a business pay more? I just don’t get it. We really don’t care about your years of experience. If a graduate can achieve that goal better than you do, then that’s exactly who we are going to hire. And hey, let’s not forget we can employ US writers too (they speak English!) and THEY charge a much lower rate than Aussies do. If you struggle to make a living due to the economics of it, here’s a suggestion: switch jobs. @Anne, you missed the point. Congrats at skimming the surface. It’s only ironic if her femininity was used as the reason to provide that remuneration rate. Are you saying that was the case? I personally fail to see the evidence of discrimination based on gender. The title should read, “The guardian, stingier than ever” instead she grabs the whole female empowerment thing as convenient rhetoric to get some interest in an otherwise uninteresting truth – writers don’t get paid enough. I am a commissioning editor for a national publication and we pay 85 cents a word. That seems fair. It’s nice work too. However, budgets are getting tighter these days, so while we haven’t reduced rates, we have reduced the work we commission out and we try and write more stories in-house these days. A marketer – can you not see that an article about female empowerment by a respected local media figure like Tracey Spicer would have more cachet and worth than a listicle by a random US college grad? Keep paying your monkeys peanuts. Maybe you can’t see the difference between work commissioned for $10 and work commissioned for $500 – but a discerning reader can. @A Marketer : No, of course you don’t care about experience. From your point of view, content is just content. Who cares what trash your potential customers read? Who cares if someone reading your content comes away thinking “These guys have no idea what they are writing about”? Or maybe you prefer to spend a few hours proof reading and doing revisions – what’s your rate for that, by the way? So good luck with combing through your contact list of graduates looking for the one who will write gold for 10c a word. Reminder: your job is as vulnerable to outsourcing as anyone else’s. Better start looking into that funeral business. So marketer, I think your bottom line is exploitation. You are no better than those slave labour merchants ripping off backpacker and immigrant fruit pickers. As a freelancer for 30 years I can well attest there are plenty of people like you. No one pays the MEAA rate. Fairfax pays 60 cents a word and I would not do it for less because my time is too valuable as I have to research,write and pitch the next story. Fairfax only pay $50 per pic to use in print and online and in all papers. Its crap but it is the bottom line and you do get exposure. But 14 cents is just insulting, what a joke. So all you graduates and blogger slave workers out there make 60 cents your bottom line. The ANZ and other big biz and our slave marketer can afford it. Look at it this way using Tracy’s example -it would be only $600 instead of $140 she was offered. Thanks Tracey and as for the Guardian’s excuse of providing the wrong rate- pathetic and extremely disappointing. Both ANZ and the Guardian have just damaged their brand and it is costing thousands -all for 14c a word. When I’m asked how much I charge per word, I explain to the client why that’s the wrong question. Shorter content (to-the-point, clear, action-oriented) is almost always better content. Creating tight content is a skill few writers possess – it takes more time to craft 200 great words that propel online users into action than to plonk out 1000 words of click bait… Writers are generally too in love with their words, and online editors have lost sight of the point of it all: provoke action, not “hits”. All the same, $150 is crap. Shame on them. Rates are getting worse. We recently wrote an article for a well respected men’s style site which receives over 5 million page views a month. It was a feature article of 1235 words and we received GBP50. Approximately, 10c a word. It’s criminal. What seems to matter now is momentum, constant feed, getting others to do the work, and the sites achieved traffic reaping the benefits from advertisers. I suggest for the hits on the articles that journalists get a percent of the advertising from that page paid over a 3 month period. That would be credible. isn’t this just basic economics? This is not journalism, it’s effectively copywriting. Why? Because the articles (whether they even mention the company or product) are intended to build the company’s brand and engender trust. There’s no public interest and a clear commercial intent. The big companies paying for this content are also not reliant on a broken advertiser-funded business model. Corporations should pay more for this compared to independent journalism and a significant number of them do. But, as a freelance writer, you wouldn’t know that if you’re working for a content marketing agency paying 10-50c a word. Those companies are making huge profit margins right now – and they can’t even write the content they sell. As for the MEAA, it’s still stuck in the dark ages of employer-employee representation and its 93c freelance word rate should be ignored. It’s several years old and is supposed to apply to independent journalism companies, not big banks. I bet ANZ didn’t realise that the writers were getting paid that low. I bet they pay 10x that to the agency. They have probably just realised that they can commission their own writers for much much less than they are paying their agency, and still pay a rate higher than the industry standard, so that they get top-notch talent too. The ‘Marketers’ may have shot themselves in the foot. I’m a freelance writer. Marketer is quite right. His (or her) point has been completely missed in by several people who can’t see over their own self-righteousness. The point was – if the content is identical, why pay more. You pay for results, not for “years of experience” or qualifications. Even if the more expensive content is better, is it cost-effective? It’s not exploitation either. You are not being forced to work for these rates. This is a business-to-business transactions, albeit on a tiny scale on one end. Same people here no doubt ask around for web designers on the cheap and the like. Basic business economics. Deal with it or find another industry. Marketer – not my experience. I have a number of editors who pay me – a journalist with nearly 20 years experience – a rate that’s higher than they could get away with paying a graduate because of 1) I have technical experience and knowledge in several areas and funny as this sounds, I turn in copy with very, very few (I’m not arrogant enough to say no) spelling mistakes, typos or grammatical errors. In my experience editors will pay more to a writer when they know that at a pinch they can just send it to layout because 99.9 percent of the time that writer’s copy is clean. Guy Sebastian – I suspect that there is an element of gender involved, paying women less than men is insidious and happens in probably every industry you can think of. Two examples. 1) About 10 years ago I worked for a magazine as a senior writer and got paid more than the editor who happened to be a women. I was the more experienced journalist and at times it showed, but she had a lot more responsibility than I did; 2) a few years ago now but a stoush between the editor of Good Weekend and one of his writers went public when SHE discovered that some male writers were being paid two and a half times per word what she was. Love this debate, as it’s one the industry really needs to have. As for A Marketer’s assertion that the ability of a 10c a word writer and a $1 a word writer to achieve a goal is often indistinguishable, you might be right in some cases. That is if your goals are things like SEO or bludgeoning the internet into paying attention through sheer quantity. I’m sure if you send both writers a brief for “Ten Ways to Get More out of Photoshop”, there ain’t gonna be a great deal of difference in the results. The post only has to do what it says on the tin to achieve the goal. Not much more is required. Half an hour with Google reading some of the hundreds of similar articles that already exist, a standard blogging template and probably less than an hour putting new words around it and the brief is met. I don’t know your goals, A Marketer, so don’t take it personal. But I encounter this kinda thing all the time. I see so many poor content briefs where ‘meeting the brief’ and ‘great writing’ are so far apart I’m not surprised some marketers get frustrated. Believe me, the writers are often frustrated too, but we need the money and we do as we’re asked. That is, until we’ve built up enough clients with more respect for what we do. And if you do book Oscar Wilde to write a listicle, damn straight he’s still going to charge you a lot more while not necessarily delivering a massively different result. If you hired a champion racing driver to drive your taxi, of course she’ll demand more pay than your regular taxi guy on basic rates. But it won’t be her fault or any comment on her superior driving ability if she doesn’t bring in more fares, cause she’s limited by the job you gave her. Content marketers should be no different to any other publishing editor. And that means knowing how to get the best out of each writer by giving them briefs worthy of them. Or having more input into the process of coming up with original ideas, instead of pushing that onto the writer as well while paying them increasingly less for their knowledge, research and IP and blaming them when they’ve met the brief but it doesn’t achieve the goal. Who’s fault is that? The writer or the brief and the person who signed off on the content? It’s too easy to blame failed content on the writer when the marketer only has a mediocre and uninspiring content strategy to begin with (if they have a strategy at all). Writers aren’t blameless either. Eg: such as certain writers undercutting the rest of the industry by accepting rates that wouldn’t even cover my coffee bill I rack up when writing a blog post or magazine column. But to say bargain bloggers are capable of producing similar content to the best in the business insults the entire industry. At the same time, it avoids the bigger question of whether the content strategy is focussed on the right goals if even crap, predictable writing can achieve them. Realist-writer you must be living on air or doing this as a second gig and and not a real writer all of the time ? It is called business ethics 101 not basic business economics. .Perhaps marketer would like to reveal him or herself seeing they are so dead keen on driving down the price. Then we don’t have to waste their precious haggling time by submitting an article to their company and you can have them all to your self. By the way no content is identical unless plagiarised. Based on the number of long-winded article comments here, it appears that writing for nothing about writing for next to nothing is a problem as well. @night woman, ethics have nothing to do with it. When it comes to editorial content, digital disruption has proven that the journalist emperor has no clothes. Before digital news/magazines, journalists were overpaid and newspapers made absurd profits. Both were benefitting from oligopolistic of the limited means of physical content production, with high barriers to entry, primarily in the form of expensive printing presses and ink. Once you were in the journo club, by default you were worth reading because no-one outside of mainstream press could be seen or heard. Journos developed inflated senses of their self-worth and contribution to society, with this artifice having been torn down by millions of amateur journos proving they could write and hold an audience. This is just the same as taxi drivers bitching about Uber. The competitive new reality doesn’t suit everyone. Maybe this is all symptom of what will probably happen in 10 years: robots replacing most non-touch human-to-human work. Since we are only looking at our own budget, we will operate what gives us a profit. So too large companies wanting to shed wages as far as they can. We’re all walking to the same end-point…. And no funding at all, yet the 5 stations I supplied all made money selling advertising. Very unfair. It comes down to federal legislation. I’m a marketer and would like to reaffirm that not all of us take the same approach as ‘A Marketer’ above. I acknowledge people for their expertise and pay accordingly. Tight budgets present challenges but they shouldn’t call for exploitation. Cheers to all the many wonderful professional writers, editors and photographers who have been let go by publishing companies. May they continue to find well paid work/jobs and prosper. Once again Australia is pricing itself out of the market! We get great quality content written overseas (US, Canada, UK) by EXPERIENCED writers at 15-25c per word, so why would i pay Australian rates? I left – well, was retrenched – from a senior writing job on a national magazine five years ago when print hit the wall big time. I’d had a long and good run, received a decent payout and, as I was at an age where I could access my super, decided to get on with my life. I’d written hundreds of 3000-word plus features, scores of them cover stories, over a two decade period and in that time my copy was picked apart and sometimes rewritten for the better, after consultation, of course, by sub-editors who knew their stuff. They made me a better writer and saved my arse on more than one occasion.. Since then, I’ve done some online writing for various websites, sometimes to help out ex-print mates who’ve been reduced to running under-resourced websites. The money is crap but that’s what the writing game has come to, but, more worryingly, any sort of oversight is all but non-existent. In the last couple of years especially, I’ve never had a query from an editor about one word I’ve supplied – they just seem grateful for anything that is more or less readable. It appears any old shite will do these days – never mind the quality, feel the width, keep shoveling that content and, by the way, the cheque’s in the mail … well, maybe next week, or month. Still, I’m all but out of it now and, anyway, there’s always a funny cat video to cheer me up. Ms Spicer should be glad that she is “living the dream” and demonstrating “employment flexibility” with an income that is “regionally competitive”. Or shouldn’t that apply to economists ? It’s not just branded content. Lots of outlets expect arts writers, in particular, to write for free. A critic can’t pay the mortgage with free tickets or free books! It also means you get reviewers, not critics. Want to be invited back? Be a lovey. InDaily, arts hub, and many others, expect arts writers to work for no payment. Even something like Overland is way below the MEAA freelance rate. Where is line drawn? If journalists are heavily editing op eds before they are published, because the op ed writer is owed a favour & the piece is published in lieu of payment by the publisher (and serves as a pseudo advertisement for their business), is that branded content? Or advertorial? Or just misleading? Anonymous (#43) suggests this is no different to taxi drivers bitching about Uber challenging their business model. Sorry, but no. Uber represents fresh competition to the cabbies by people who haven’t gone through the same system, which sorta parallels this discussion, but Uber aren’t undercutting the industry by anything near the same level as we’re now seeing in writing. It’s just brought greater choice and convenience for people wanting to get from A to B. For writers, we’re not complaining that there is an influx of new writers with differing levels of skill providing competition. To be honest, there is plenty of work to go around right now in the branded content space. The issue is that the value of those words has plummeted, regardless of experience, skill or subject expertise, and that has eroded client expectations as they now expect remarkable content for next to nothing. Plus, we’re not just talking about paying for words her. Or at least we shouldn’t be. Sure, it’s possible to get experienced writers on lower rates overseas. But the biggest challenge I encounter time and time again is clients who can’t find writers with the necessary subject matter expertise to make the content genuinely worthwhile. You don’t just want a good writer, you want the right person for that topic and audience too. Hence why The Guardian approached Tracy Spicer to write that article and not ‘nameless agency writer’ from wherever they can get the best rate. And whatever skills, reputation or experience makes that person the right person to write your content therefore must have a value. Hence a higher fee. I wonder if the debate about getting more for “branded” content is actually just deeply old-fashioned. If you’re asked to write a story that is the same as anything you write for a publisher (which is what good content marketing should be) then what’s the difference? Most brands don’t even want your byline and the effort involved in producing a piece is exactly the same. Everyone commenting on this thread has provided their content for free.